Most discussion about the fiscal cliff fails to address the most serious structural fiscal problems. These problems are so called “entitlements.” Calling these entitlements does not mean that anyone is legally entitled to these. All that it does is relieve Congress from budgeting these. This has been done for the convenience of Congress and is entirely against the best interests of the nation. The following table is from the United States Treasury Department. This is an analysis of the non-funding of Social Security and Medicare. Social Security is the column headed OASDI. Medicare is the columns headed “HI, Part B, and Part D.” HI is hospitalization, Part B is visits to doctors’ offices, and Part D is prescription drugs. This report is from 2010. This Treasury data analyzes the money presently in these accounts, future anticipated revenues and future anticipated expenses. It then present values the future shortfalls. The conclusion is that the present value of future shortfall was in 2010, $77.9 trillion. It means that if we had $77.9 trillion in these funds instead of essentially zero we would be fine. By comparison GDP is just over $15 trillion. The National Debt on Tuesday was $16.31 trillion. Total personal Income in 2011 was $12.95 trillion. The HI (Hospital Insurance) part of the problem has a solution. But the HI shortfall is only 8% of the total. 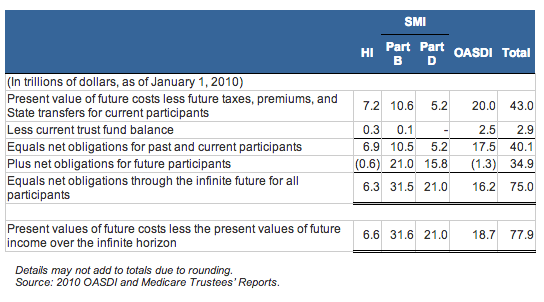 As the trustee report from 2009 indicated “HI Trust Fund could be brought into actuarial balance over the next 75 years by changes equivalent to an immediate 134 percent increase in the payroll tax from a rate of 2.9 percent to 6.78 percent, or an immediate 53 percent reduction in program outlays, or some combination of the two. Larger changes would be required to make the program solvent beyond the 75-year horizon”. Medicare “B” and “D” (doctor’s visits and prescription drugs) are funded differently and make up a massive part of this shortfall. Only about 20% of the money in those funds comes from premiums and the rest comes from the general fund which is to say that Treasury borrows it. We are underfunding HI and, largely, deficit financing Medicare “B” and “D”. The only solutions for Medicare B and D are to cut the benefits and/or increase Medicare taxes so that they are not deficit financed. The necessary increases in taxes to stop the underfunding of these programs would be large and, likely, recession (or worse) inducing. This problem is massive and it makes no sense to address the fiscal future of the nation without addressing this. Unless we start addressing that $77.9 trillion shortfall, it doesn’t matter what else we do. The fiscal cliff is really a fiscal molehill. Entitlement underfunding is a problem larger than Everest.